May 18, 1968, C. W. Nelson. Annaphila casta is a rarely collected small day-flying moth (FW length 11 mm) with a dark forewing with a white band enveloping the unusual large reniform spot and pure white and black hindwing that flies in western Oregon during the spring. The wings are stubby and broad. 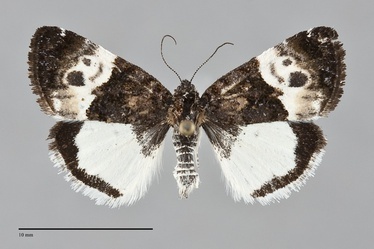 The forewing is dark black-brown on the medial half and lack distinct markings on this portion of the wing The distal median area is pure white followed by bronze. The distal wing is dark gray. The white reniform spot is unusual in that it is shaped like a "B" with a gray lunule in the medial portion and two roughly semicircular dark gray areas in the lateral aspect. The spot might be derived from the reniform spot proper and the fused adjacent postmedial line. The white subterminal line is visible on the costa. The fringe is dark gray. The hindwing is pure white with a gray base and sharply marginated black marginal band. The fringe is black anteriorly, two-toned with gray basal and white distal components at mid-wing, and white posteriorly. The head and thorax are dark gray. The male antenna is simple. The eye-size is reduced. This species can only be confused with Annaphila diva in the Northwest. The hindwing of this species is pale yellow, not pure white as in A. casta. 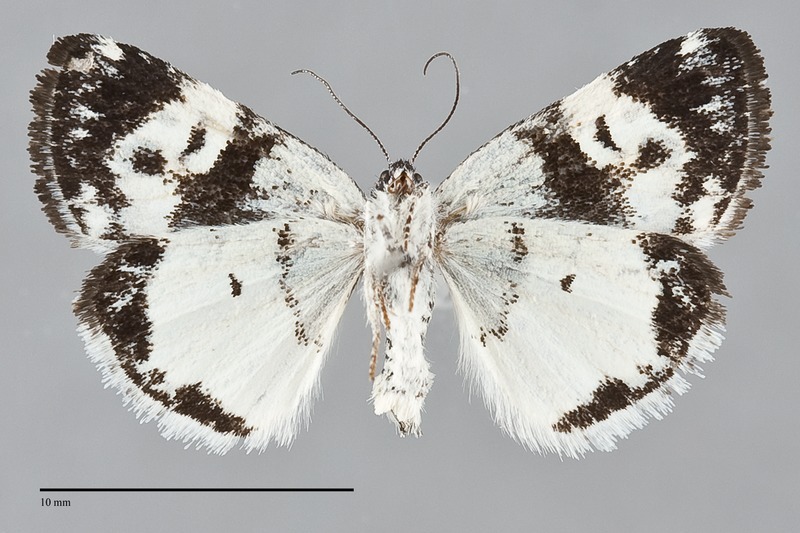 The white markings on the forewing are reduced in A. diva relative to those of A. casta. This species is rare in open wet forest and riparian habitats at low elevations west of the Cascades, primarily in the coastal rainforest zone. Annaphila casta has only been collected in the Willamette Valley in western Oregon in our region. The range of A. casta includes northwestern California outside of the Northwest. This species is a foodplant specialist feeding on monkey flowers (Mimulus spp.) in the Scrophulariaceae. Adults are diurnal and visit flowers during the day. They fly in the spring. The only Northwest record of this species is from mid-May.